Recently I was sent some Lush goodies to try and test out for you guys, and of course I was delighted with the results of most of the products! Lush is my all-time favourite beauty brand, I put my trust in all of their products and rarely have had extremely bad reactions to their products.. These products are part of a new range of 16 inventions, celebrating the UK Lush website's re-launch and re-design. First off, both massage bars are absolutely gorgeous, beneficial to the skin and are lasting ages for me! I prefer 'Friends With Benefits' to 'Peace' however, as it has a citrus chocolate scent to it and I feel the scent lasts longer on my skin throughout the day. 'Peace' has a rich cocoa scent to it, and I recently bought another one for a friend's birthday present (she's a chocoholic!). Both bars are extremely moisturising on the skin and are soothing after a long hot bath. Unfortunately the photo of my bubbleroon has ran away, so apologies for using the site's photo! I was very excited to try this new bubble bar, as I've been a fan of them for ages now. One of my favourite treats, are Laudrée macaroons so when I saw this bubbleroon I ran a bath straight away for myself! It smells unbelievably delicious, very floral and sweet. I used the full bubbleroon for my bath, and it created a ton of bubbles and left a moisturising layer of suds on top of the water. I do think it's a tad expensive however, and I'm not sure I'd spend nearly a fiver for it. The water's colour turned out very orangey in the photo, but it was more of a coral colour. This was my first time using steamer tabs from Lush, and I've heard such excellent reviews about their toner tabs, that I was dying to try them out! They're very simple to use, you just pop one into a bowl and lean over it covering your head with a towel. The evaporation from the tabs, steams your face and the essential oils (Neroli and Lavender are used in the Moon & Sun tabs), to clean your face and relax your mind. You clean your face after to remove the excess oil and dirt. I used cold water, as it closes your pores and soothes the hot skin. I'll definitely be repurchasing these, as my skin felt so rejuvenated afterwards. I'm a sucker for lip balms, as I constantly use them and am always on the hunt for news ones. I've used Lush lip products before, but I wasn't too impressed with this product to be honest - it just isn't for me! I dislike coffee, and seeing as this lip balm's flavour is coffee, I instantly didn't like the taste. It isn't strong though, as the vanilla powder calms down the coffee scent down but it just wasn't my cup of tea (coffee?) at all. The colour is nice, it leaves a burnt copper/gold tint to the lips, which again isn't for me. I think it'd suit someone with a darker skin tone to me, as I'm extremely pale. It is moisturising, and I do think some people would love this! Similarly to the lip tint, I like this product but it just doesn't suit me! 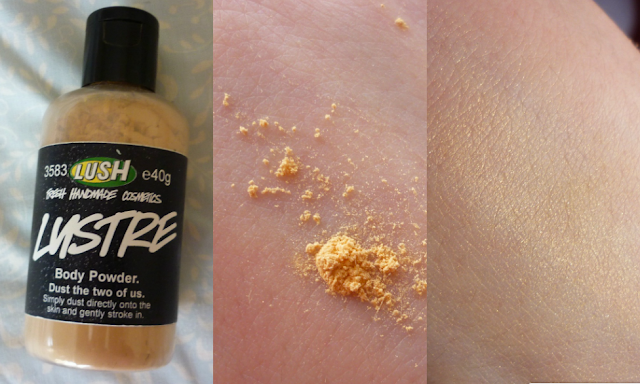 It's a gold shimmered body powder, to add a nice sheen to the skin. It smells gorgeous, and does look well on the skin for nighttime, but I do think it'd suit people with darker skin tones to me (It would look really nice over false tan too!) 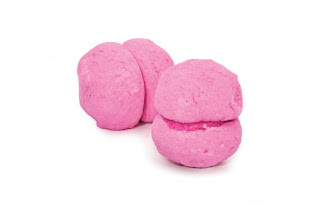 It's scented with 'Lust', one of Lush's Gorilla perfumes, leaving a gorgeous light jasmine scent to the skin. I dislike how it comes in a bottle though, as it's quite awkward to use. A loose powder tub would be much handier.